So what exactly is Net Neutrality? Surely you've heard this phrase thrown around a lot more than usual recently, and it just so happens the reason the topic's been abuzz lately is simple: it's a pretty big deal, and it affects all of us. What's not news, though, is that the Internet has become a common tool for all – heck, it's rapidly replacing the television as the go-to for just about anything for a growing majority of people – but what does Net Neutrality mean for the average user and why should we care? Let's examine it through HBO's The Wire and Title II regulation. Net Neutrality is the concept that everything on the Internet – the pure bits of data that beam around the country over our cable lines – is all regulated equally. That is, this bit of data isn't more important than that bit of data, and as such, all data moves through the Intertubes evenly. While we can pay more for more bandwidth – the ability to send and receive those bits of data faster – there are no favorites when all the bits are in network – just the steady stream of the Internet beaming into your computer, phone, or gaming console. 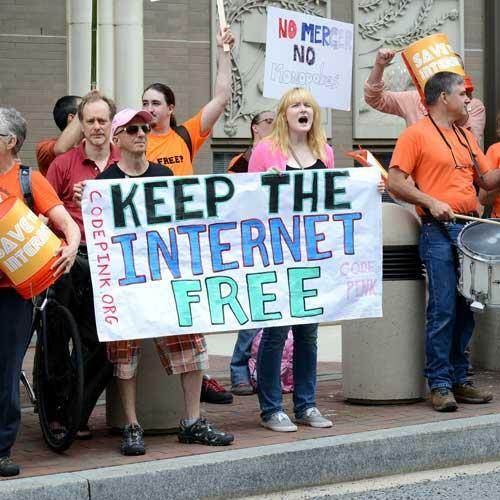 Net Neutrality protects the consumer and the content providers from being unfairly charged for access to those bits of data – meaning that Net Neutrality ensures all data is treated similarly when it comes to cost to access. Recently, Amazon announced amazing news – well at least for me. HBO's The Wire is now accessible through Amazon's Instant Video service, and if you are an Amazon Prime member, it's free to watch. Ahh YEAH, I say! – the highest-rated TV show in history is finally accessible in a way that I like through a service I gladly pay for. I pay a cable bill to get access to the Internet, which allows me to watch McNulty crack wise. Amazon also pays a bill for the bandwidth that it takes to push McNulty's wisecracks to my computer. The Internet Service Provider, the company that controls the network, gets paid twice – once by Amazon and again by me and my cable bill. Without Net Neutrality, the ISP can and has already told services like Amazon and Netflix that if they want their customers to get their videos, they will need to pay up for a faster service lane. In other words, if you want to ride in an express lane, you've got to pay a higher toll. So now they'd be getting paid three times for essentially one transaction. I pay to access the Internet to stream the video to my computer. Amazon pays for the bandwidth. Amazon then pays again to make sure that this stream of data doesn't get arbitrarily slowed down by the Internet Service Provider, thus keeping me – and all their other customers – happy. If it sounds like highway robbery, it should. Because it is. The Internet has become an essential part of our lives, and for most of us, it might as well be a public utility for how much we rely on it. This is where Net Neutrality has taken a step for the worse. In January of this year the U.S. Court of Appeals for the District of Columbia threw out the previous FCC regulation on ISPs. Previously ISPs had a special set of laws that kept Net Neutrality in place. The reason for the ruling was based on a problem with definitions. Judges love them some technicalities. Broadband Internet access was defined differently than your old school land-based 'common carriers.' Common Carriers, or traditional phone companies, are governed by a thing called Title II from the original 1934 Telecommunications Act. Broadband Internet is currently classified as an information service. Since they were classified as something not under the ruling of the FCC, the previous laws in place that helped protect Net Neutrality have been thrown away. Now we have the scenario I described above, as we pay, they pay, and they pay again to the same company to provide us our access to the Internet. Perhaps this is just open market economics. Perhaps it's a part of increasing desire to reduce government regulations. Perhaps it's just greed. But in our age with all of us tethered to the most amazing thing society has ever produced, we should keep it as open and as accessible as the air we breathe and the water we drink.